Wipaq offers the state of the art technological features in the model 336 ADA gate which can be utilized by the handicapped individuals as well as for passage of maintenance carts and delivery vehicles as well. It can be bespoke for the customer’s requirements. * Key Lock Control - To control direction of travel manually by key (to lock or unlock) or may be used to override electronic locking controls. 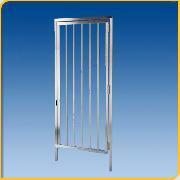 The HT 336-ADA Full Height Gate may be ordered in a variety of different configurations. Please call for details.